Wild Horses 1.5" Suspension Lift? I have a 76, C4, Cut Fenders, 33/12.5/15 tires. This is primarily an on-road, in-town vehicle. I would like to get the ride dialed in and also have the front / rear basically level. I'm not sure what lift components I currently have but it's 1.5" front / 2.5" rear. I'm assuming the rear lift is coming from add-a-leaf's on the original springs and the front lift height is possibly from sagging 2.5" coils. Body height is stock. 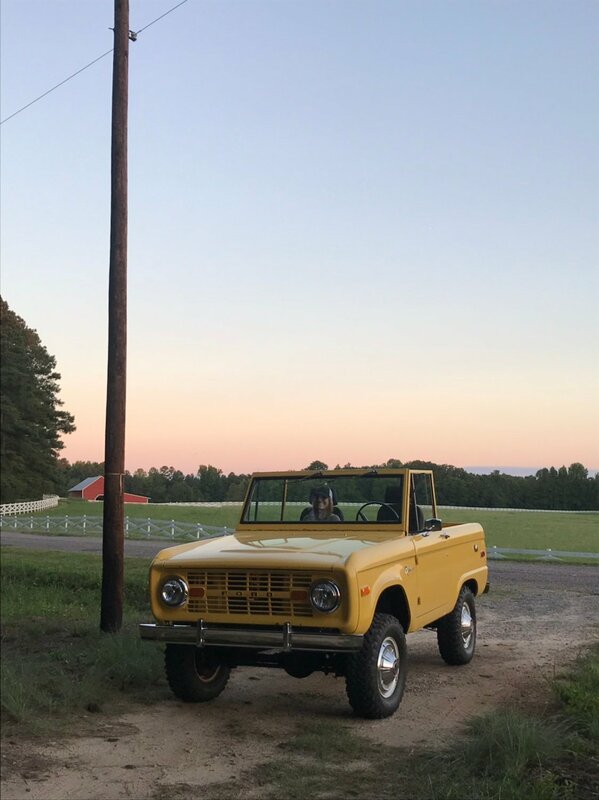 I had the WH Premium Bilstein 2.5" lift on my previous Bronco and liked it. However, I'm thinking about using the same components but going with 1.5" Leaf / Coil Springs and Stock Height Bilsteins. Ordering soon. Would appreciate your thoughts / comments. Thank you! 76. Crate 302. FiTech. C4. 33x12.5x15. PS. PDB. 1.5" WH Lift. KrawlersEdge Cage. Here’s the best pic I have with the WH 1.5” coils up front with 30x9.5 tires and 170 engine. The rear is a 1” block on what I presume is stock leaf springs but they may also have an add a leaf. Nice looking Bronco. Do you have a body lift as well? Yikes BGB! That's got to be the thickest add-a-leaf I've ever seen put in an Early Bronco! That size leaf is usually meant for full-size pickups. Seen the like for old Chevy trucks from the 60's and 70's so I bet it rides pretty "firm" to say the least. New springs, or at least a thinner add-a-leaf would likely go a long way towards a better street ride. Certainly updating the shocks will go a long way too. Those bushings are toasted pretty good, so probably the shocks have been on there for some time now. Glad you're going through it to upgrade. With those bushings looking like they do, I would certainly check out the body bushings too. Just to make sure they're not too crushed. You've already seen how the Bilstein shocks can work. Be interested to hear your feelings when this one is all done too. I think you're on the right track with minimal lift, especially if it's still got the Inverted-Y steering. That '76 should be a pretty good road rig at that point. '71 Wagon, 3.5" WH, F150 disc brakes and steering, 4.11 33x11.50 Thornbirds, Kayline soft top, Hanson bumpers. "Built, not bought"
'68 LUBR, 2.5 + 1 WH, 31x10.50, 4.56, Explorer and 4R70w by EFI Guy, WH disc brakes, Hanson front bumper, Warn winch. "Bought, not built"
Yes, I should’ve mentioned a 1” body lift as well. It's fine on a smooth road, until I hit a pebble! What does the complete package look like for this set up? Basically what I have listed or and I missing anything? Thank you. What does the complete package look like for this set up? Basically what I have listed or and I missing anything? Nope. Pretty much all there is to it. Front and rear springs, and four shocks, and you're down the road. The Inverted-Y steering linkage is the most finicky when lifted, but not everybody has issues with it. And for only 1 and a half inches? Probably nothing to worry about and everything else can run stock. The shocks would be stock length (basically the same between zero and two inches of lift) and should work just fine assuming you have the stock mounts still. Looks like it though. Now for the only issue. Springs! I'm not sure what the status on them is. A few members got them already, but the fact that they're not on our website yet tells me that there is some delay. I'll find out what's up tomorrow (if nobody here already has inquired about it) and let you know. Aren’t these the referenced springs on the WH website? Which c bushings with these, 4 or 7 degrees? Haha! Thanks TX. Yes, they're there. I jumped to the "Suspension Systems" page by mistake and they're not listed there so I panicked and thought something was wrong. Thanks for setting me straight. And guaranteeing me a good night's sleep tonight too! Regarding C-bushings, it's almost the same answer as for most lifts. Depends on how much caster was built into your axle from the factory, and how much you want. If you had the specified caster, or if you still have manual steering, then even the 2° bushings would be desirable. But for most of us, if you already have power steering, the 7° bushings would be called for. Any chance you already have a printout of your alignment settings? If not, any chance you feel like spending a little money and throwing it on an alignment rack to get a printout? If not, and your Bronco is a '66 through '75, I'd go with the 7's. If it's a '76 or '77, I'd go with 4's. But as we found out just recently, not all Broncos were created the same. One member (sorry, forgot who) found they had lots of caster even with 3.5" lift springs. And theirs was not a later Bronco either. It was one of the '75 and older models, that just happened to have lots of caster built into it. But the bottom line is I'd really want to know exactly how much caster I'm going to end up with because that will let me get the best combination of handling and steering effort, without too much drama. And the less bushing you can get away with, the less angle on your front pinion/u-joint. Up to a point, more caster is better. But also up to a point, your u-joint can only handle so much angle. If you never put it in 4wd, then just leave the front shaft off, put the biggest c-bushing in there, and go for the gusto in the caster department. As you can see, even with as little lift as just 1.5 inches, caster still comes up as something of an issue. Paul - Thanks for response as always. I have a 1973 with power steering. Can’t take the Bronco for pre-measurements as it’s a non running project. Have been eyeing these springs and will then need to buy bushings too (already bought stock height Bilstein shocks). I have similar setup on my other 1973, PS, Bilstein, except with 1” Moog springs and I think I did 4 degree bushings on it. Had it aligned at a friends shop but failed to get print out of specs. $1083 later (+ Shipping), I'm all in on the 1.5" lift. Cool! Thanks a lot too. Glad to have you as a repeat customer, naturally! Let us know how it goes together, and how you like it after you've driven it a bit. Hopefully your steering doesn't mind the slight lift. Most don't until you get to 2.5 and more, but you know how that goes with the "most don't" part.